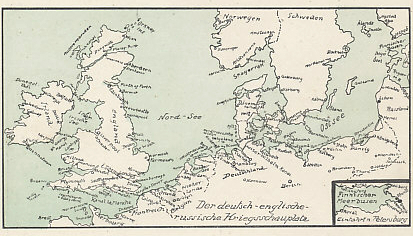 Map of the North and Baltic Seas (labeledNord-See and Ostsee) from a folding postcard of five battlefronts: the Western and Eastern Fronts; North and Baltic Seas, Mediterranean and Black Seas; and the Serbian-Montenegro Front. Deutsch - österreichisch - russischer Kriegsschauplatz. Deutsch - belgisch - französ. Kriegsschauplatz. Bei Änderungen der Kriegsschauplätze erscheint Nachtrag. Nachdruck verboten. German - Austrian - Russian theater of war. 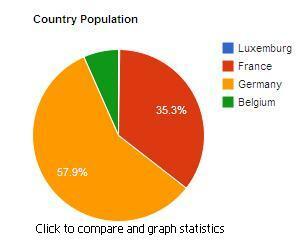 German - Belgian - French theater of war. English-German Russian - Sea theater of war. Austro - French-English - Sea theater of war. 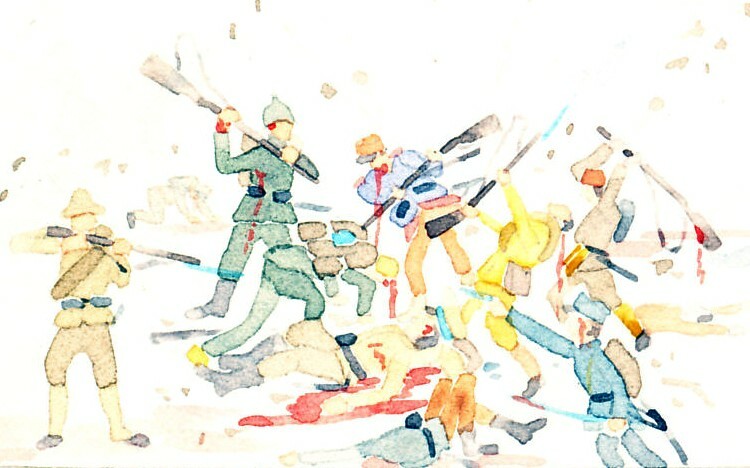 For changes in the battle fronts, an addendum is shown. Reprinting prohibited. The Skaggerak is a strait between Denmark's Jutland Peninsula and the coasts of Norway and Sweden. 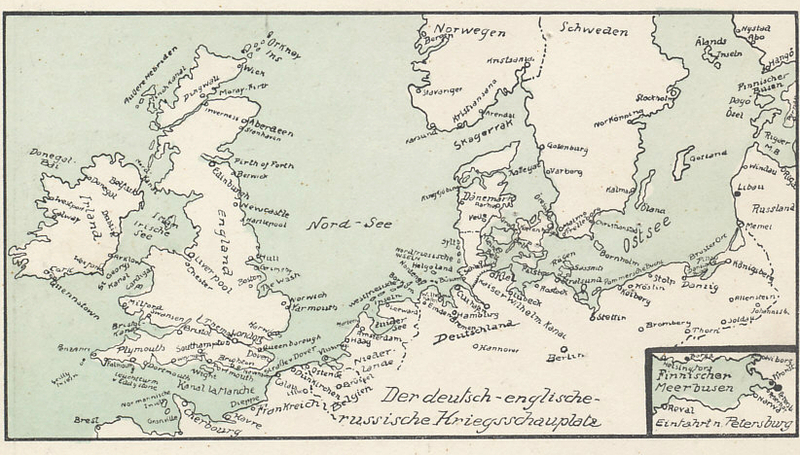 With the Kattegat, it connects the North and Baltic Seas. 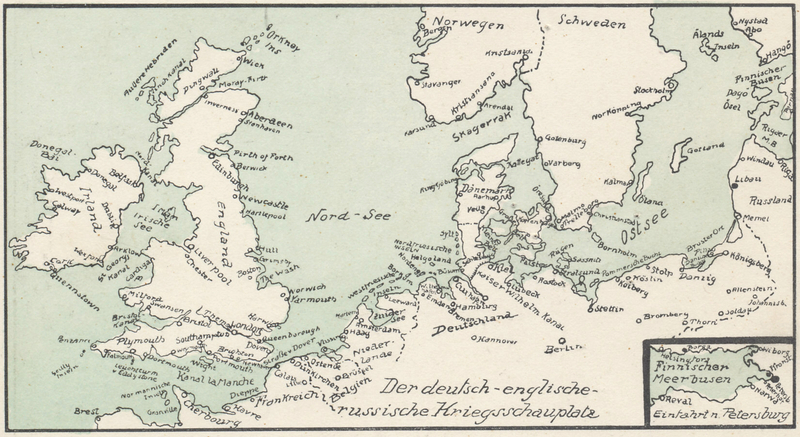 Surface ships of the Entente Allies could not pass the straits, but by September 4, 1915, Britain had five submarines that had successfully crossed to the Baltic. Skaggerak is a strait in North Sea.